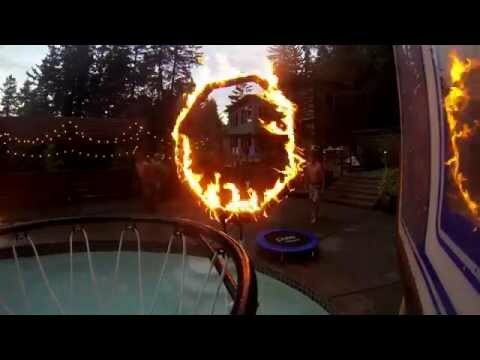 In a 23-second video, nine men complete a basketball dunk in a pool, a feat that includes jumping through a ring of fire. This isn't the first pool dunk attempt for the group called Jam Broz. The group posted its first pool dunk video last year, and it now has more than 1.3 million views. But the most recent video took pool dunking to a new level by adding fire to the mix. Not to be tried at home, this trick is attracting attention. The video was posted on July 14 and had more than 1,500 views at the time of publication.